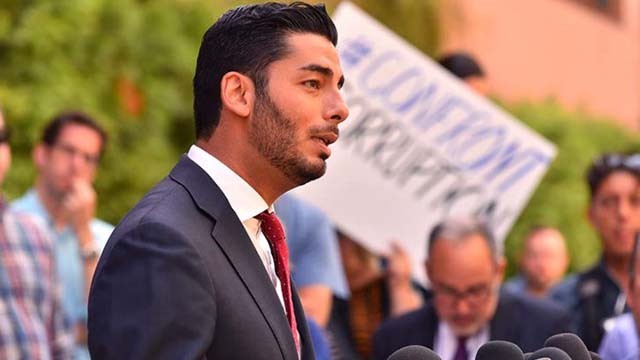 Democrat Ammar Campa-Najjar hinted Thursday that his office-seeking days aren’t over after the San Diego County Registrar of Voters certified final results in the 50th Congressional District race. Campa-Najjar noted the corruption trial of Hunter set for Sept. 10, 2019. Campa-Najjar didn’t immediately respond to a request for further comment on his political future. The Registrar of Voters Office announced the final, certified results of the Nov. 6 midterm election, with voter turnout totaling 66.4 percent. San Diego City Council District 8 ended up being one of the tightest races in the county. Vivian Moreno, a staffer for termed-out District 8 City Councilman David Alvarez, scraped past San Ysidro school board member Antonio Martinez by 549 votes. Moreno finished with 50.94 percent, Martinez at 49.06 percent. The other City Council districts up for grabs, districts 2, 4 and 6, were all washes. Physician Jennifer Campbell beat incumbent Lorie Zapf in District 2 with just shy of 58 percent of the vote while Monica Montgomery finished with 57.74 percent of the vote over District 4 incumbent Myrtle Cole. District 6 incumbent Chris Cate bested Tommy Hough with 53.78 percent. The three new City Council members and re-elected City Councilman Chris Cate will be sworn-in at 10 a.m. Dec. 10, with the 72nd City Council meeting for the first time later that day at 2 p.m.
Nathan Fletcher finished with a resounding 67.37-32.63 victory over Bonnie Dumanis in the race for the county Board of Supervisors’ District 4. For District 5 county supervisor, San Marcos Mayor Jim Desmond beat Michelle Gomez with 56.33 percent of the vote. This year’s turnout is the highest the county has seen in a midterm election since 1982, according to the Registrar of Voters office.